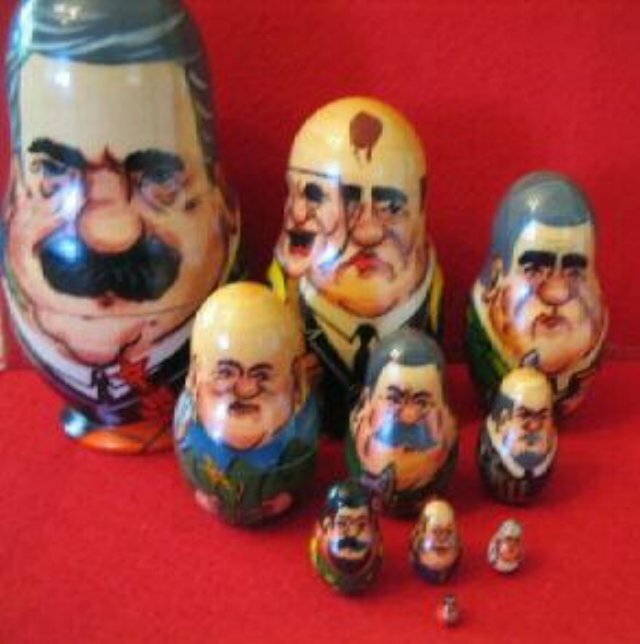 Set of Political caricature leaders from the Soviet Union era and Russia. The largest is 8" and they go down to about half the size of a penny. They are all in excellent condition with no cracks or breaks. Marked on the bottom “Mockba” (Moscow). Includes Yeltsin with military rival on back (Rutskoi). Gorbachev behind mask, with wife Raisa strapped to back. Brezhnev chained to 1980 Olympics mascot Misha bear. Khrushchev, jacket stuffed with corn, flying sputnik. Stalin with famous pipe and battleaxe (WWII reference). Lenin chained to battleship Abpopa (Cruiser Avrora). Tsar Nicholas II, Tsar Alexander, Catherine the Great, and Peter the Great.